Use communication boards to strengthen language skills related to familiar topics and daily routines. Students are asked to label pictures and to create sentences using picture symbols with printed text. Ready-to-use boards are included. You can also create your own picture boards using the picture symbols. As students participate in the activities, they use the boards to describe needs, feelings, actions, events, and locations. 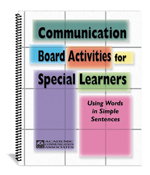 The activities can be used with verbal students who need practice in the use of simple sentences or with nonverbal students who point to communicate. Students with autism and developmental disabilities will also benefit from the lessons. The book now includes text in English only. Foreign language adaptations may become available in print or CD formats.